FoMM stands by the adage that in order to change legislative po licy, one must have either money or votes. Because we have – alas! – no vast sums at our disposal, we tend to rely on our very vocal supporters to champion our position with legislators. However, as some funds are necessary for this purpose, we do ask you for donations. In the spirit of transparency, we present you with this overview of our finances. The work of FoMM is governed by an all-volunteer working board of directors. We do not employ staff, paid or unpaid. We hire the services of a part-time contract lobbyist. 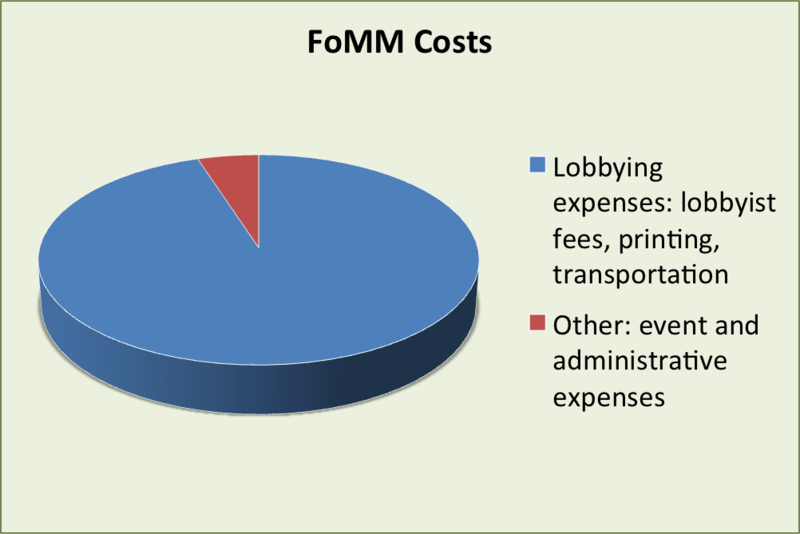 The bulk of our expenses are lobbying costs. Many of our volunteers help us by paying their own expenses. Donate through Paypal (coming soon). Mail us a check. Use the Contact Us button below to request the address. Donate by credit card (coming soon). Set up a direct bank draft for repeated donations (coming soon). Check Facebook for upcoming fundraising events in your area. Donate goods or services for silent auctions. Sponsor one of our events. Come up with a creative new way to support our efforts – and tell us!